Delicata’s wine festival in Nadur starts tonight. Some like it red, some like it white, some enjoy both kinds and others even drink a glass of pink. And, why not? There is no reason to be monogamous in the choice of wine. If you haven’t discovered where your tastes truly lie, now you can find out at the Delicata Classic Wine Festival in Nadur starting today. Nothing helps you explore your personal wine preferences better than sampling a flight of different colours and styles side-by-side, and you can do just that at the event. All weekend long, every evening from 7.30pm till midnight, there will be a rainbow of over 25 wines to toast with. These include the semi-sparkling Frizzantes made from the native old bush vines Girgentina and Ġellewża. There are the tasty white, red and rosé DOK Malta Medina and DOK Gozo Victoria Heights boutique wines, a selection of the flagship Gran Cavalier and Grand Vin de Hauteville ranges, as well as the sweeter Dolcino and Falcon wines, the lush Casella Moscato and other varietals of the Classic Collection, and all three Pjazza Reġina wines. The very popular, so-called SpritZZers are showcased too. Delicata’s brand of spritzers (or ready-mixed wine coolers) was released in Malta as early as 1997, at the time of all the rage in trendy bars in California, London and New York. At only 3.9 per cent alcohol, all three spritzers are semi-sparkling, medium-dry in style and bursting with fruity flavours. 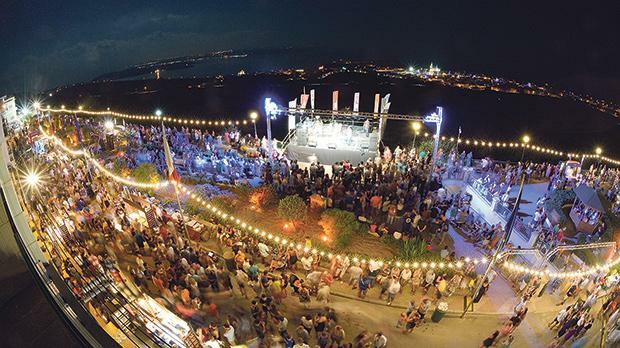 Good food and live music performed by local talent add to the fun of what must be one of the most popular wine festivals in one of the world’s tiniest islands. Entrance is free but to taste the wines one needs to purchase a bespoke festival glass and a wine purse filled with wine coins for €15 at the door. The event is organised in collaboration with Nadur local council at Ġnien il-Kunsill. But, with so many different wines to try, wine lovers will think they’re in heaven. After all, that’s where all the rainbow colours are. For more festival details visit www.delicata.com. Georges Meekers is Delicata’s head of sales and an award-winning wine writer.